I picked up my Golden on September 29, 2006. He turned 10 this past June. In the last 10 years he has, without a doubt, been the greatest joy and blessing in my life. But not just in my life - at times it seems like my whole neighbourhood has fallen in love with him. 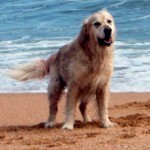 He is a favourite amongst children, adults, dog walkers, old dogs, puppies and middle agers. So many people have approached me about Simon - some just want to meet him, others want to take pictures of Simon with their children, some want to know where they might find a treasure like Simon. Without hesitation, I send them to Chrys Haefen to look for the perfect Golden for their family. Your track record is incredible - between my friends and I, we have collectively brought home six different dogs from Chrys Haefen. Each one of them has been a perfect family member. I may be coming back to you in the near future to add to our family. But for now, I just wanted to tell you how grateful I am to have Simon in my life. We wanted to give you an update on our Daisy dog (mom-Moon and dad-Jerry), she turned 13 on February 14th Valentine's Day!! We can't believe how well Daisy is doing for her age... the vet has told us that she has the blood of a young dog! She does have aarthritisin her back legs, but gets around pretty well! Thank you again for giving us this amazing and beautiful dog! We have two children ages 11 & 8 and we all just adore and love Daisy so much!! 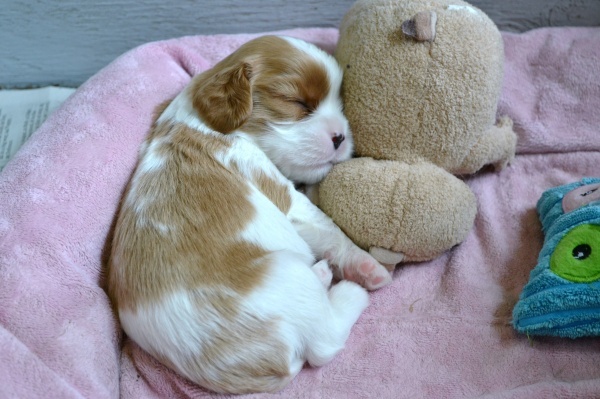 I have just brought home my new puppy from Jennifer. 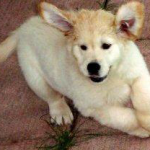 My dad bought me my first Chrys-haefen puppy when I was 10. That was 47 years ago. Since then I have always had a Golden by my side, and in my heart. 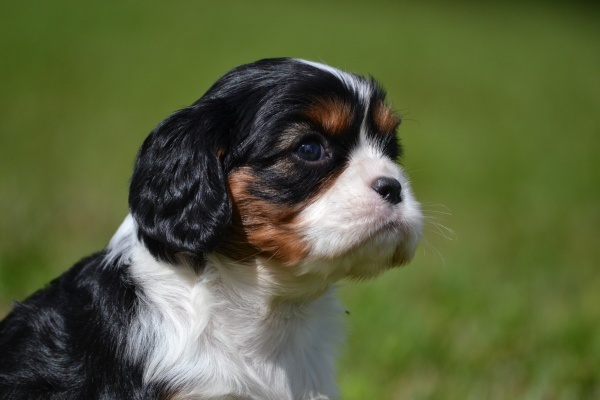 This new puppy is my 6th.They have all been Chrys -haefen, all males, all amazing dogs. Sadly, my boy, Rocky just passed away. He lived a good, long healthy life. He would have been 15 in May. Cal, my boy before Rocky, was almost 14. My first boy, Coby, lived to almost 16. They have all been great family dogs. I have camped, swam and hiked with all of them. This new boy, Gander, has come to my home well adjusted and outgoing. He promises to be yet another "best friend". 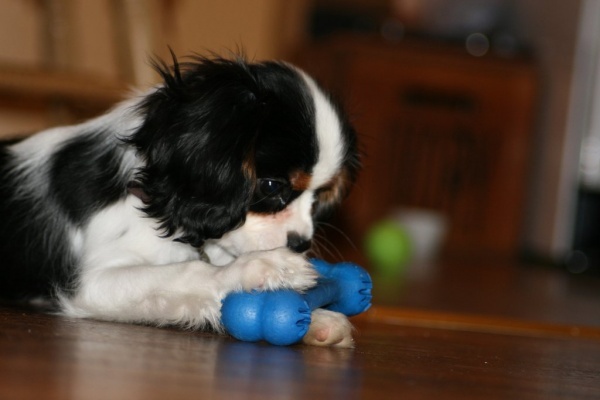 Jennifer is a expert on breeding dogs with steady temperaments. She is also a breeder who stands by her dogs, and their owners. Thank you, Jennifer, for my beautiful Goldens. Just wanted to give you an update on little Timmy. He is doing GREAT! Such a sweetie, and such a fun personality. 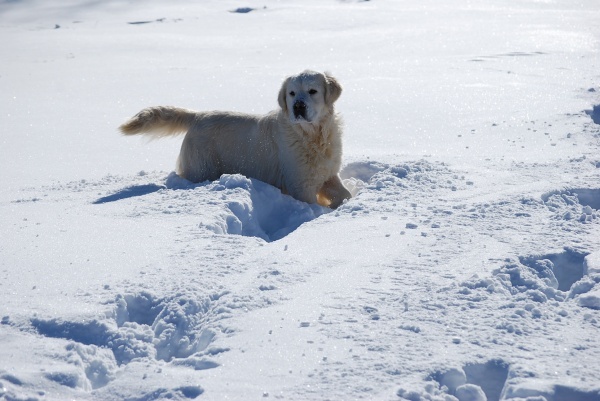 He has no fear of meeting other dogs and despite the cold and snow is going for walks with Nigel and keeping up just fine. I've attached a few pictures. He loves Lucy, the cat, and they chase each other for hours. Nigel is improving and has started to chase Timmy in the backyard, which is such a joy to see. He is indeed a special little boy. Just had him at the park and he went up to a 160 pound Bernese...the Bernese ran away! It was hilarious. Hope you and all the doggies are well! I do not know if you remember Copper. He is now 7 and I bought him from you when he was 2 1/2. His first owners had returned him to you. He is the best dog in the world and I could not live alone in my home without him. I do not get out much so he is with me all the time- following me from room to room. I have a boy walk him, loves to play with the grand children but I believe he is happiest sleeping on the bed. The painting on the wall is Tracker- I got him from you and he lived to be l5 years. Thank you for supplying me with my furry angel-no animal can be loved more than he is. Friends and family believe he was meant to be with me. Letter from Rick and Debbie R.
Thought you might enjoy a few pictures of our Abby. She is just the sweetest bundle of joy and we couldn’t have a better dog. We are enjoying her so much and she has given us so much love. Her temperament and demeanor is everything we expected. This is our second golden and they are the best! Thank you for breeding such terrific dogs. I just came across our Chrys-haefen file and wanted to send off a quick note to say thank you, again, for so much joy. Our three dogs have enriched our lives more than I could ever say. Whatever it is that you do, the results are aabsolutelymagical. We named this dog "Homer". I contemplated taking two pups from the same litter - we could not choose- but good sense took over and we settled on one, a smart decision. We were going to name them Homer and Virgil. Perhaps Virgil will come and join Homer soon. But nevermind all this. The important point is; we are deeply indebted. Many thanks. Now, if you would please forward a question to Opal: I am going through this file and I do not find a payment to her for the ground transport of the dog from Toronto to Buffalo. I can not remember whether I paid her for this and I have no record of the payment here. It was $200 or $300 as I recall. Perhaps I did send her a payment, but I do not think so and I feel terribly remiss. With the very best to all of you from Elysa and me. I remember when we first came to your place and we were greeted by Jerry. (RIP) You asked us what we were looking for and we replied we wanted a GR just like Jerry. Well look…that is exactly what we have. He was just at the vets and he weighs 87 lbs and is in perfect health. I think he would be around 3 ½ yrs old now and is everything we could have asked for. Cash is so very loyal..smart..obedient and gentle. Aside from being a handsome fellow he is also incredibly ( insanely ) strong. Although I highly doubt he would ever hurt a flea and has of yet but he is capable of being loud and protective in an intimidating manner when strangers go by. A while ago my wife was approached by a weirdo while she was walking him. Cash got between Diana and this person and made it clear in no uncertain terms this person should be on their way. Which of course he did. Yes we are proud owners and never tire of all the compliments we have received from friends to passersby who feel compelled to say something nice about him. This is usually a daily occurrence. All he really knows is love and affection and if you were to see him this would be so evident to you. It has been a while since I sent you any pics. I hope you like them. We adopted Penny at 6/12 years of age, in October 2011. 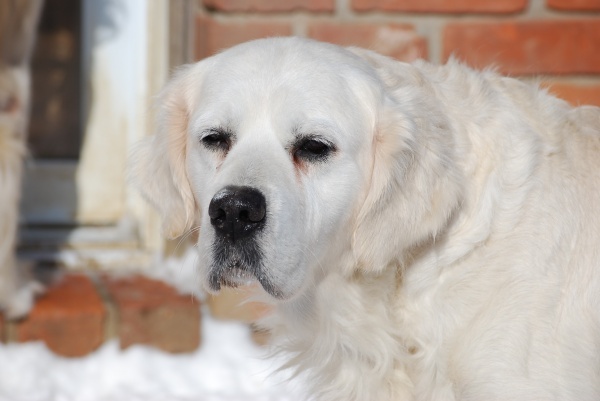 She was one your mature dogs available at the time and she was a fantastic choice for us. We lost a 12 year old Golden last June but still had a 7 year old Golden. Although there were some growing pains at first, I would definitely recommend an older adoption to the right home. She is now a big part of our family and is loving life! 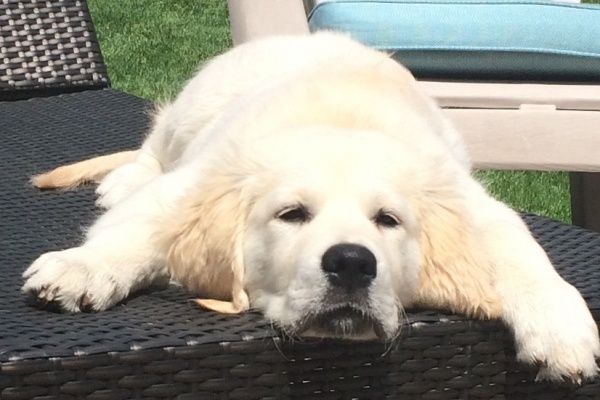 I'm writing again to let you all know how much we love our new puppy, Finn. I do have one question for you.....did you train the puppy before he got to us? He has not had one accident in the house or in his kennel. He also seems know how to walk on the leash and even sit. He even sleeps through the night (as long as he's in someone's bed). We have had many puppies, mostly labs and one golden before this, but none of them have been anything close to Finn. I think, it has been easier to train Finn, the puppy, then my own boys. One other question. Wherever we go people ask us were we got him. Do you have any left from his litter? I know that my Mom will fall in love with him too. Thank you again for this wonderful pup. 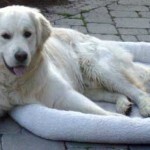 Letter from Linda P. & Joe J.
I was just looking on the website as I have recommended your kennel to a person that is thinking about getting a Golden. Briar was from a litter of Majestic and Shooter. Everyone LOVES Briar, he is just amazing. He is exactly the type of dog that we wanted and you chose the best one for us out of the litter. Great choice, we absolutely LOVE him. I am sending a few pictures that I adore as I love the winter and so does Briar. I’m sure with so many people that come through your kennel you wouldn’t remember us but I am the person that works for Ren’s Pets Depot. 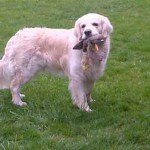 I always recommend your pup’s to everyone that asks about Briar and who are interested in Golden’s. You truly do have wonderful dogs. 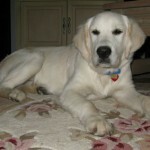 Linda P. & Joe J.
I just wanted to write to say how thrilled we continue to be with our sweet boy, Finnigan! He is Laila X Ivan, born Aug./09. He is such laid back, sweet and patient boy. He never chases intact females and we can leave him off-leash with the door open or in the front yard with us, without ever worrying about him trying to run off because he is just that loyal! He greets all guests at home with eenthusiasmand calms down in an instant when you show him your palm or tell him leave it or gentle. What a wonderful attribute, especially now that we have just had our 3 child! He loves playing with other dogs at the dog parks, and we always have people stop is to say how beautiful he is. We've even had several people ask if he is a stud! I guess all of this is greatly thanks to your expertise and fabulous quality of dogs!! We are in love! Is there any chance that you might look at him to be used as a stud? We bought him on a non-breeding contract, to which we have obviously abided, but is there a chance that he could be bred properly, if you deem him suitable? Im sure all of your customers have only good things to say about their babies, but I didn't think it would hurt to ask. Also, we are looking to get a female next summer! Thanks again for matching us with a great boy. Please be in touch when you can. 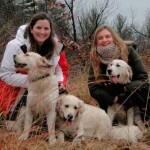 Chrys-Haefen Kennels not only has beautiful dogs but a extremely helpful and supportive owner. Canuck is now a beautiful, loving, three-year- old companion and the best dog I have ever owned. She is obedient, affectionate and calm. She loves people but does not become a nuisance. Jennifer has never failed to answer any questions I have and gives excellent advice that has always helped me solve whatever concern I have. Good Afternoon Ladies, find enclosed a couple of pictures of Walle-e. He is very gentle and affectionate,loves to be with us no matter what we are up to. Everyone who meets him falls in love with him. He is getting along very well with out other dog Maggie (Sheltie). They go for walks/play together and sleep side by side. There is nothing like going out for only a few hours and coming home and having Walle-e so excited and happy to see you . One cannot help but love this breed of dogs. Thanks again for breeding such a wonderful little fella, I call him my little big man. We are just informing you that Bernadette was put down this morning at 11:30 AM. We adopted Bernadette from your kennel back in October 1995. She was a wonderful gentle/active dog and never had mean bone in her body. 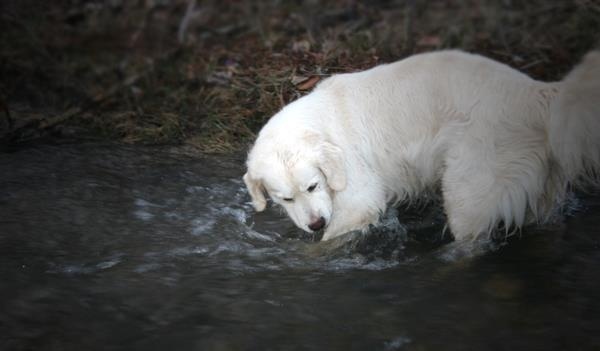 She loved chasing birds and loved the water and let everybody pet her. We are attaching her birth certificate and a few pictures of her at 15 years. We took her to the lake on her last birthday and she had a great time with the family. She played with our three boys and it was funny when she always stole the tennis ball from the boys when playing ball hockey. She lived a healthy 15 Years and 2 Months and would you think she was still a puppy. We thank you for giving her to us Jennifer. 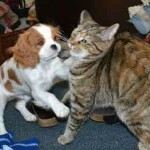 I have been wanting to send you some pictures of Fenway and Pippen for so long. However, I haven't remembered to do so until now. My friend, Mark O'Neil, referred me to you years ago and what a great thing that was. These two dogs have been the absolute joy of my life. I just wanted to share an update with you. The first two pictures are Fenway. 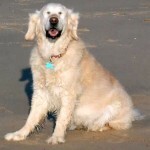 (Happy Boy and Smile for the Camera) Fenway was born on November 28, 2001 (one of Waves's pups) and is very much a "Momma's boy." He can't wait until I get home and follows me everywhere I go. Then, whenever I sit on the couch in the family room, he waits for the blanket to be placed on the couch. This is the sign for him that he can now jump on the couch and stretch out next to me. On a nice cold winter evening, he keeps me very warm! He is so gentle and lovable that you can't resist him. We refer to him as "Mr. Handsome" and he know what that means. When he hears that he raises his head and nose up in the air with great pride. He has been exceptionally well-trained and heeds commands since he was 3 months old. We think he may be the best dog we have ever had. His health is good and we truly love him. The second two pictures are Pippen. Pippen was born on March 2, 2005. He will be 5 years old very soon. He is one of Stinger's pups. Pippen has retained more of his "whiteness" than Fenway and still thinks he is a puppy. He is incredibly strong and weighs around 97lbs. He "talks" to us all of the time with his little muttering sounds and always lets us know when it is dinner time. He gives us that look from time to time that suggests he has been "up to no good" so we tell him he is giving us the "sly eye." He still loves to sleep in a fully stretched out position - sometimes almost on his back with all four paws up in the air. In the summer, he loves to lay in the grass, roll around in it and every so often gets grass stains in the weirdest spots on his body! He is quite the contortionist! But, then he flashes those big brown lovable eyes at you and your heart melts! Thanks to you and Chrys-haefen kennels for dogs that have truly brought us so much joy! Letter from Andy & Lori M.
We're so happy with our boys, Baxter and Beau. They really get along great. Baxter is gentle when he needs to be and Beau can certainly hold his own when they get horsing around. 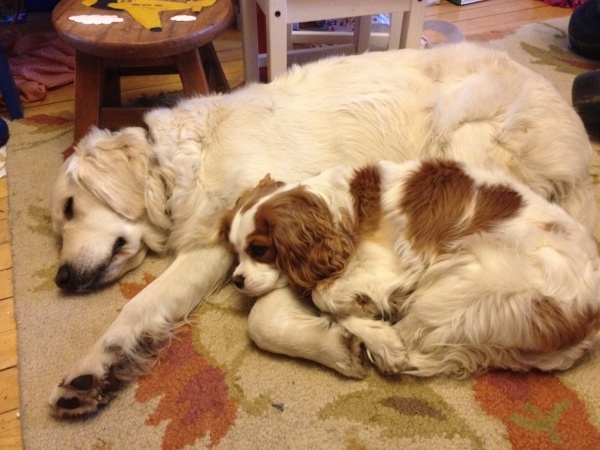 Once they've tired themselves out, they snuggle up together for some rest. They do enjoy each other's company. 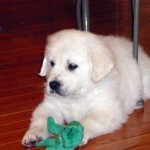 Letter from Elena Danese P.
We purchased an adorable puppy from you way back in August 1996 and we named him Molson. 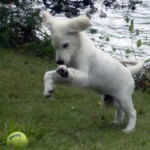 He was born to Dancer and Sherlock and was just the most beautiful, sweet puppy and friend we could have ever had. 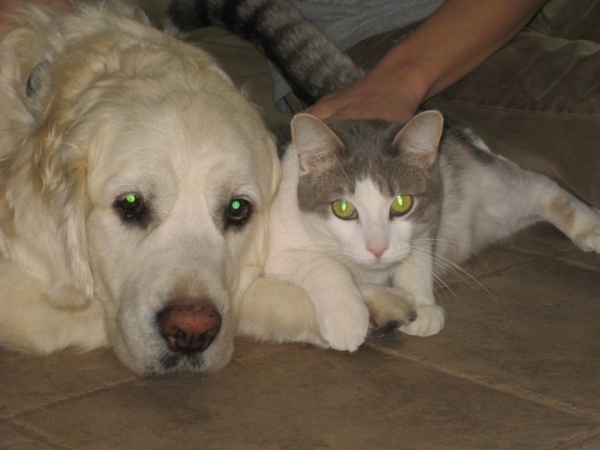 Molson was a very special part of our family and he brought us many, many years of joy and happiness. He started out as our 'only child', but over time we had three children of our own, and Molson befriended each child in his own special way and always made them feel like he was there to watch over them and provide a friendship and love that only he could. He became known as the neighbourhood dog as everyone in the area knew who he was and always wanted to pat him and play with him. At Halloween, everyone would come up to our house and ask for Molson first before asking for candy, that's how popular he was. Even with people who were afraid of dogs, they enjoyed Molson's company and he made them feel at ease enough that eventually they all ended up giving him many pats on the head and tummy rubs. I think that is a testament to the wonderful dog he was, both attributed to his breeding and also, I'd like to think, to how he was raised. He really was one of a kind. Molson passed away this summer on August 6th, 2009. He was a sweetheart to all he encountered up until the end, and although it still continues to break my heart that he is no longer here with us, I just wanted to let you know how much one of your dogs has affected the lives of me and my family and friends. Thank you for bringing these wonderful animals into our lives. Letter from Peter & Carol D.
We thought you enjoy some seeing some photos of Chester. He has been with us for two years now and during that time he has brought so much love and fun to our family. Everywhere we go he is admired and people want to know about his background. More importantly he has the most wonderful personality. He obedient, loyal and sweet. You said that you breed for temperament and Chester is a fine example of that....he truly is a magnificent animal!!! 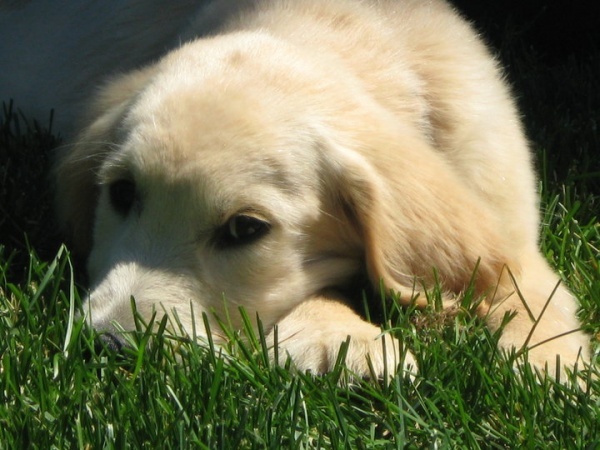 Letter from Leanne G. & Jeff W.
We wanted to send you an update on our golden Indie who was born March 16 2007. Her parents were Beam and Jerry. 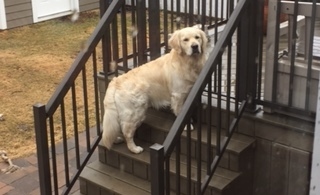 Indie is 2 years and 9 months and has turned out to be a wonderful golden girl. Indie is a everything we could have hoped for in a Golden. She has an amazing personality, she is eager, outgoing, social and kind. She treats life like an adventure is not afraid of new things. She happily travels with us, loves to camp, boat and participate in our active lifestyle. Indie is kind to our friends children, in fact just the other day she was lying on the floor next to our cousin's four month old and held still while he patted her face and head. We took her to training as a young pup and while she had an abundance of energy in her first two years, she has done very well and loves learning new things. We have attached a few pictures of Indie for you. Thank you for our girl, we couldn't imagine life without her. Letter from Don & Judy G.
I am sending you five pictures of our Gili at play and rest. You can see the intensity and Joy in this little guy. 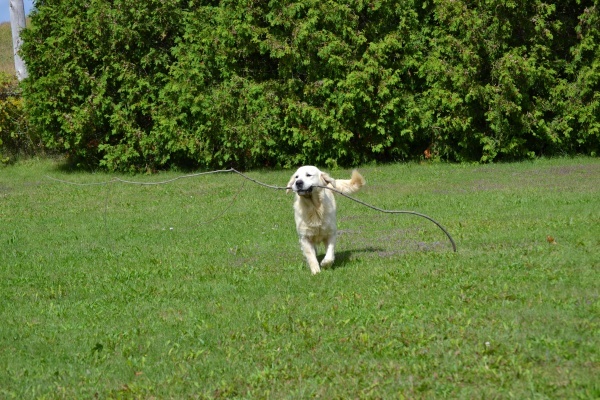 He brought a lot of happiness to Yofie(before he died), our big Golden. I would have loved to put these on your website, but didn't know how. Maryland, USA. 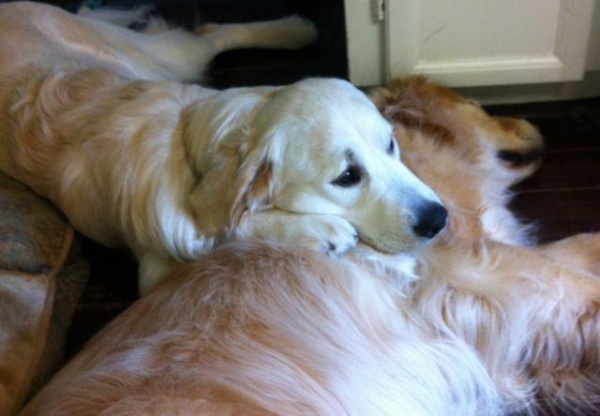 I just wanted to let everyone out there know that your kennel is a great place to get a golden retriever. We got ours 3 years ago, and he has been the most loving, playful, healthy dog since day one. 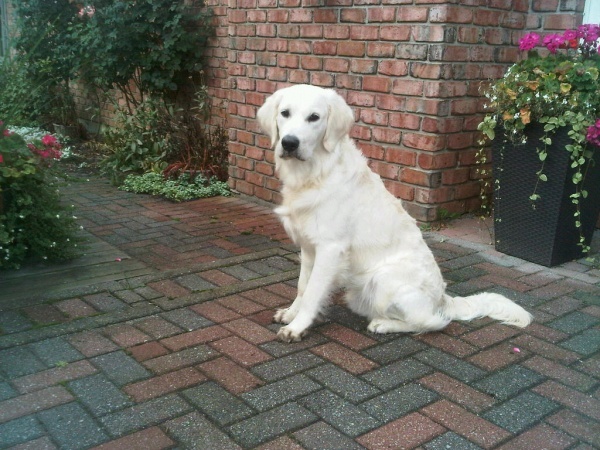 Everyone that meets him comments on his nice temperament, his great personality, and on his nice light blonde colour. He was easy to train, and we have not had any problems with him. We love him so much I cannot imagine our lives without him. He truly is a member of our family. 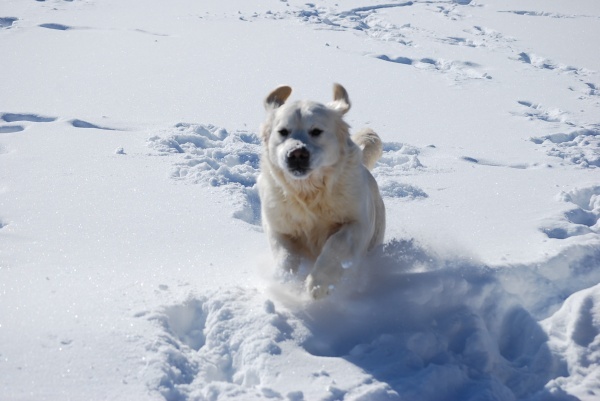 He loves to swim, play in the snow, go for long walks, and of course cuddle. 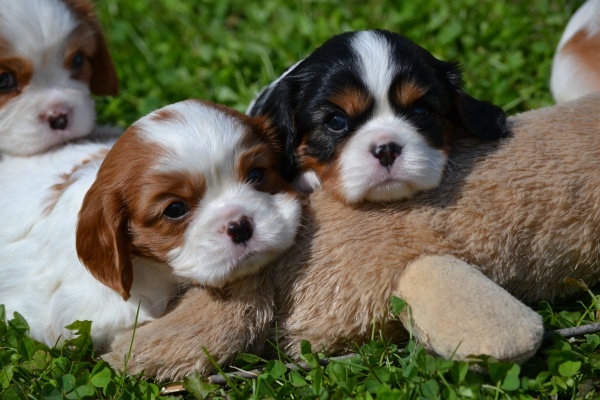 It is true that a dog's behaviour depends a lot on how they are trained, but I would definitely recommend getting a puppy from your kennel since it is so important to go to a trusted breeder. I did quite a bit of research about breeders before getting my dog, and your name kept coming up so I knew that was a good sign. The day we picked him up I was impressed with how you took such god care of him by giving him a nice bath and trimming his nails before his ride home. 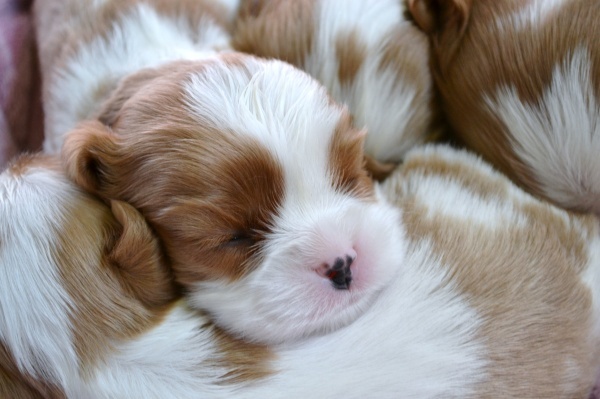 All the puppies are kept in nice areas with their brothers and sisters and they are taken care of very well. 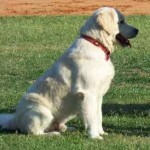 I also find that the english type of golden really stands apart from the typical darker coloured american kind. I will definitely be recommending you to others. Letter from Mary Beth, Alex, Taya & J.
Mary Beth, Alex, Taya & J. Letter from Amy & Brandon P.
Just wanted to send a quick update on Nelson (Gemma – Mom, can’t remember the name of the Dad) he was born April 20, 2007. He is not only incredible handsome (as all of your dogs), he is smart, so enjoyable to train, loyal and always wanting to please us. 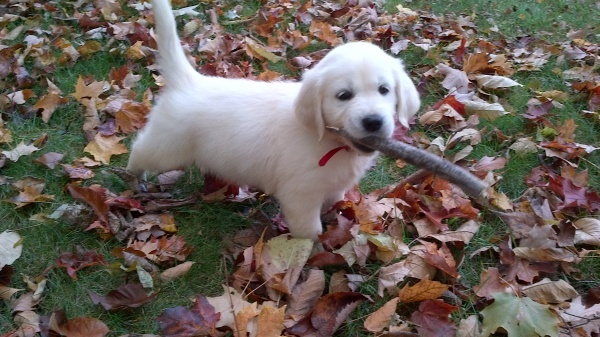 He is the perfect Golden! He has settled into our life and I am not sure what we use to do without him! Nelson is just over a year in the pictures and about 79 pounds. Thank you for the most amazing dog! Though my sweet Chrys-haefen boy is six years old today, my link with the kennel actually goes back decades. I was about fourteen when my parents finally relented (meaning Mom finally relented) and allowed us to have a dog. 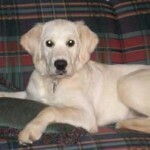 A veterinarian recommended that Dad get in touch with Jennifer at Chrys-haefen Kennels. I remember Dad taking us girls out to the kennel in Alliston, heading down the basement stairs to the cozy litter bed to choose our pup. 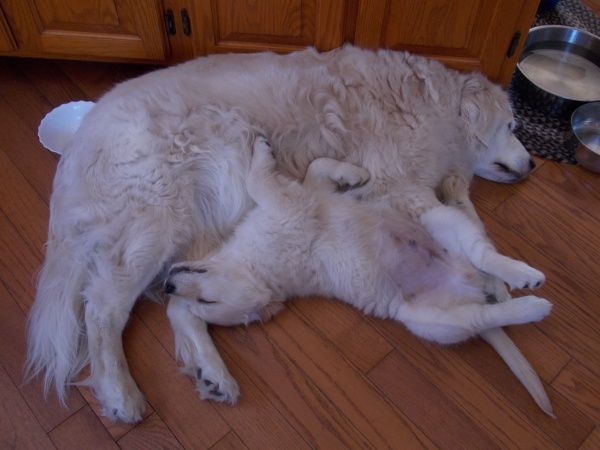 Dad brought home our first golden retriever several weeks later. He looked like a fluffy lamb in a blanket box. We named him Luke and we just adored him, well, everyone but Mom, who resented clean up duty. Sadly, he died at the age of three. Dad was distraught and, in time, called upon Jennifer again to see if there might be any pups available soon. Mom and I were in no hurry. I was still grieving and Mom....well.....she was still cleaning. Within weeks Dad came home with Ben (I think his pedigree was filed under the word Sunshine for some reason). Ben was as mischievous as Luke had been docile, and it took me a while to bond with him. 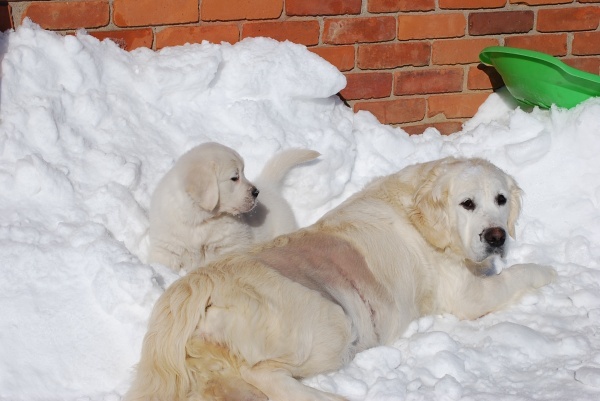 Mom stood with the pail and repeated the oft- heard phrase, "That dog's days are numbered." Ben was with me from high school until the day I married, and one day after several months of married life away from home, I collapsed in tears, not from homesickness, but because I missed my dog so much. Ben adored my husband and often rode shotgun in the front seat of our car, window down, head hanging out, tunes blasting, ...cruising chicks, my husband would joke. Ben was not too happy to give up his seat to me. We were in charge of taking him to the family cottage because he was so happy to ride in the hatchback and chomp on a new bone. On the day we brought our first born to Mom's, a friend brought the infant in the house and upstairs for me. We marvelled at the way Ben cornered me whenever this baby cried, as if to tell me I was needed urgently. How did he know this "creature" was mine? Ben's tail was a disaster; a tornado in a room. It cleared coffee tables, whipped reading glasses off faces, and in time, knocked over our just sitting six month old. These were hilarious moments. When his tail wasn't moving, Mom complained he was always in her kitchen, under foot. Of course, he had to greet everyone with a gift, too. He even gingerly crumpled Mom's reading glasses numerous times while in gift mode, and Mom eventually resigned and wore them crooked, anyway. It was several months after we'd had our second child that I got the call that Ben was dying in the veterinary hospital. He'd lived to eleven years of age, and this time it was Mom who grieved the most. The kitchen had so much damned room those months. I had loved our dogs too much to enter into dog ownership lightly. I knew that I couldn't have a dog until my boys were tall enough to withstand the whirlwind on the stairs, and until I knew someone could be at home with him during the days. 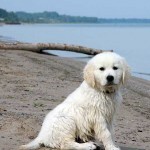 We pondered for about twenty years before we looked into golden retrievers and were surprised to find Chrys-haefen, once again. Oliver has been with us for six years and I can't begin to tell you how many strangers have praised this dog. They always comment on his beauty and are always surprised that he's not a pup. Leaving him intact as Jennifer had requested, has kept him in excellent physical condition. Oliver is my boy, but only marginally more so than our son, Peter's. When Oliver turned a year, we bought him two kittens to keep him occupied, and they have succeeded in doing so. Though declawed early, one cat loves to swat him while he sleeps and eat his dog food while he watches from the other side of the patio door. The other cat wants to be his baby, often seeking affection under his chin, or trying to sneak into his crate with him, or finding comfort in his dog bed when he's away. The sound of an elephant herd on the stairs at night no longer causes us to stir. We now know that everything will be in place in the morning and that once again, Oliver had just wanted to be part of the cats' chase game. Oliver is six today and I am forty-nine. I just thought I'd tell you guys the role your dogs have played in my lifetime. Letter from Ron & Nancy. Well, we never would have thought there was another Golden out there like our Maddie, WRONG!!!!!!!!! 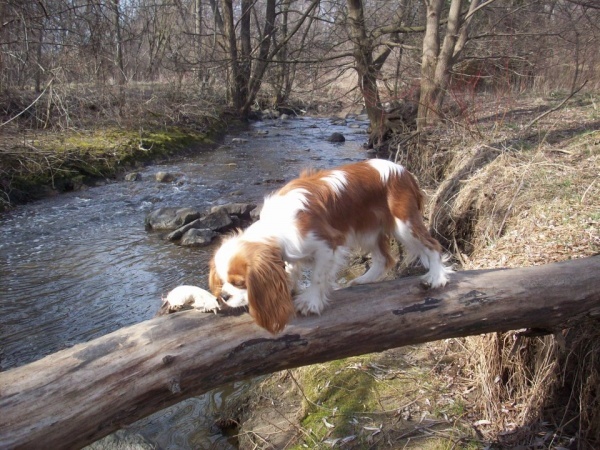 For those of you out there who may be at a stage in their lives that an adult dog works better than a puppy here is our story. We purchased our first Golden at the age of 3, loved and enjoyed here for almost 10 years, she passed in March of this year. No need to say how we felt. She left a huge emptiness in our lives. She was an unbelievable dog in every way. We'll never forget her. 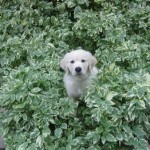 We now have another Golden named Thyme ( Once Upon a Thyme ) how cute. 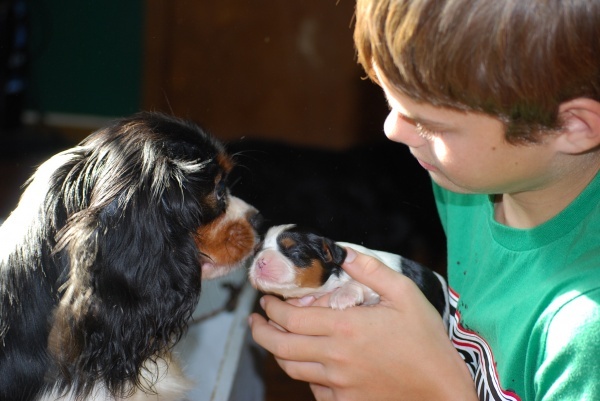 Thyme was a show dog and loving Mother to many puppies at Chrys-Haefen. Thyme is 8 years old, a retired lady. She has been with Nancy & I for 2 weeks today. She is amazing, the hole that Maddie left is now filled. Thyme is everything we could have only dreamt about. Beautiful, Healthy, Loving, Social, Smart, Friendly and the list goes on. We also have a cat who loves Thyme and they are getting along famously. Thyme is also perfectly house trained and leash trained. Thyme will enjoy her retired life with us, it's seems like a match made in Heaven. ( Sometimes we think maybe Maddie sent her to us ). Will send pictures a little later. 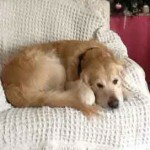 Hi Jennifer - I have been meaning to send you an update on Cody for ages, and finally got around to it! The picture says it all - he is growing into the most amazing dog that you could ever imagine! Of course I am biased! Cody is now almost 7 months old (born April 15th of Penny and Euchre). He weighs an astonishing 65 pounds (astonishing for me, as I have never had a big dog before! ), but is still putting on weight every week - but no fat at all, just a very solid build. He's very blonde, and everybody comments on his lovely colour. He has the most amazing temperament of any dog I have ever encountered. He loves everybody and everything, dogs, cats the works! 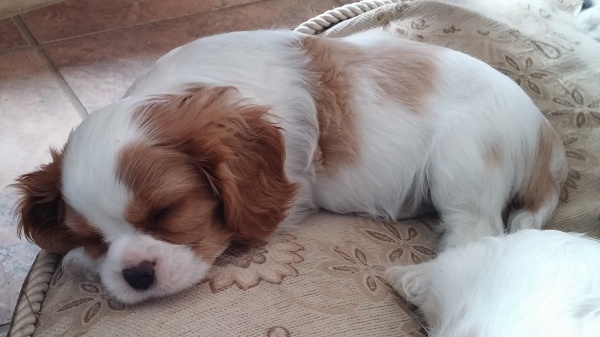 We picked him because my wife is in a wheelchair, and wanted a quiet dog, not too excitable, and as a puppy when we saw him, he seemed to fit the bill. He was the perfect choice - he is very quiet, totally laid back, and almost unflappable. He has never ever growled or raised a lip, and when the doorbell rings, he doesn't even bother to get up and see who it is! You can put your hand in his food bowl while he is eating, or take a tasty treat right out of his mouth and it is almost like you can do anything you want with him, and it is impossible to upset him. I take him with me a lot when I visit my wife in the nursing home, and he walks quietly next to the wheelchair and never pulls at the leash. All the residents know him, and want to pat him, so I share him around - I think it is good therapy for them. But he is also very smart. This week he started level III obedience class, having aced the first two! He amazed the other puppy owners when by the end of the level I class he could sit for 5 minutes with a treat on each front paw and another balanced on his nose, without going for them! He knows all the basic commands, both voice and hand signals, and is now starting to work off leash. I am also teaching him to count, which is quite an impressive trick! Well that's all for now. A big thank you again for raising such an amazing pet! I just want to tell you what a wonderful girl Reese is! She will soon be celebrating her first birthday! I had a great experience getting to know you before purchasing Reese and I enjoy the fact that you have continued the relationship after Reese was in my home. When I have questions you are there with answers! You breed lovely, great tempered dogs with awesome structure! 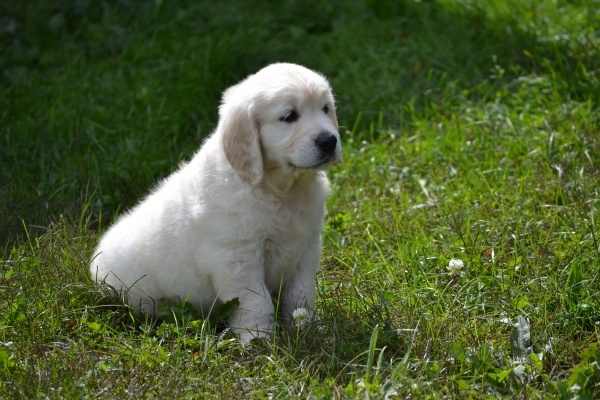 When it comes time in the future for another dog, I know I will come back to the Chrys-Haefen Goldens! Thank you for my wonderful, beautiful girl!! They just don't come any better than her! Enclosing some photos of my fabulous girl "Reese" by herself and with my daughter Desi! Sorry about the amount of photos!! But I just can't help myself she is so photogenic! So technically it is your fault cause you bred such a wonderful dog!! We are so pleased with our dog that we needed to let you know and share our story with others. Sydney is almost 9 months old and and has become an integral part of our family. We have come along way from the inquisitive group on the May long weekend. All five of us very much enjoy her company.She enjoys walks in the conservation area and people. She truly enjoys her boys whether it be playing with them or just being with them with her head on their leg for a pat.She has responded well to training and has passed Level 2 at "don't blame em train them". Although she does not look well trained in the picture , the picture was taken and then she was shooed off the sofa. we think it is just such a great picture of her. 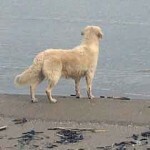 We very much enjoy her calm , but playful nature, and have had many comments on how well natured she is. (including our vet ). Thanks so much. I found your name on your website. My name is Chris Gardner and I live in Orlando, FL. I have a beautiful 11 1/2 year old champion named Dudley (Chris-Ti Dudley's Legalized Theft). Dudley is the son of Can. CH. 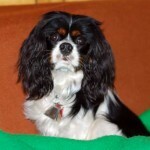 Chrys-Haefen Private Eye OS (Sherlock) and Can.CH Cal-Vo's Graceful Geniveve CGC (Geni). 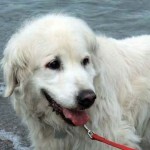 Dudley is a beautiful dog, but is beginning to really struggle due to his age. I have two daughters, 7 and 5, who adore the dog and I am concerned that his absence would be devastating to both them and me. I have owned goldens for over 28 years, and Dudley has been, by far, the most extraordinary dog I have ever known. Dudley is stocky with an enormous block head (like his father). He weighs about 72 pounds and has a long feathered cream coat. The most remarkable thing about Dudley is his temperament. 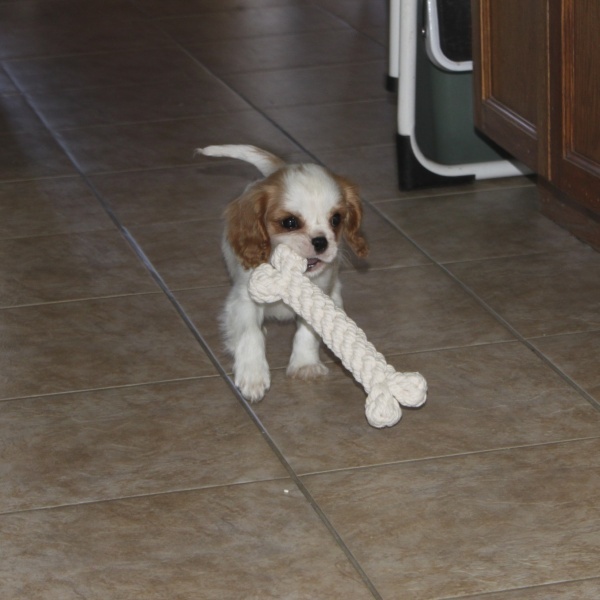 What is interesting is that Geni had another litter from another stud, Magnum, and my in-laws bought a puppy. 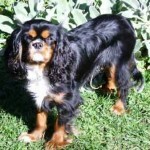 That dog, now 7, is beautiful, but cannot compare to Dudley. 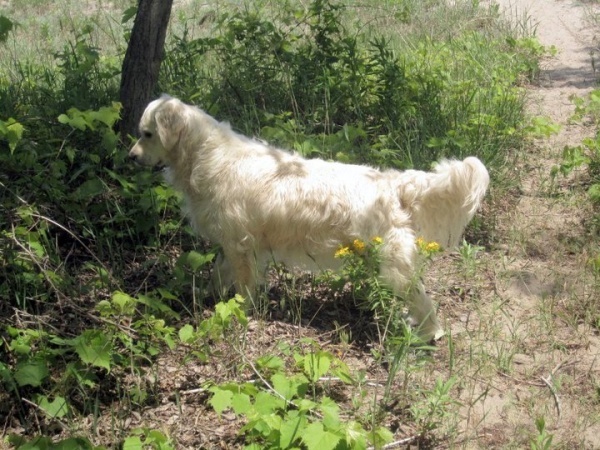 The difference is primarily in the stocky body, the block head and the temperament. Thank you in advance for your time and consideration. In October I was standing on Yonge Street watching runners go by in the marathon. I noticed a puppy with her owners also there, she seemed quite calm and very white. Her owner confirmed that the pup had a lovely disposition and when I asked where she came from, they told me Chrys-Haefen Kennels. Our 13 year old Golden had died in September and we were still a bit ambivalent about a new pup as the loss was still quite fresh. 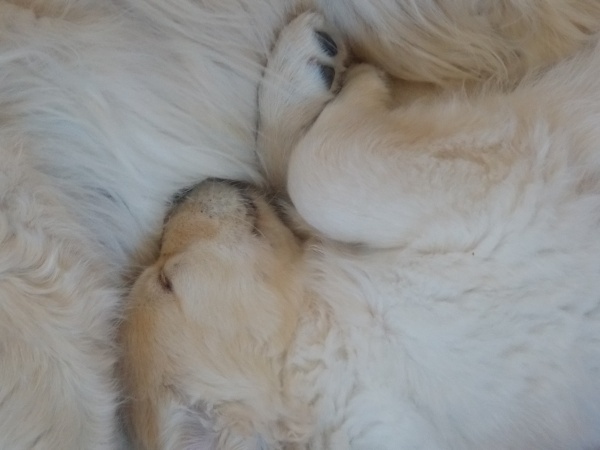 I contacted Jennifer at Chrys-haefen and thus began our journey to acquiring our new puppy "Pearl" In the new year it seemed time again to share life with a dog so off we went to the kennel and chose a sweet white puppy. Her name is Pearl and she is quite a pet. 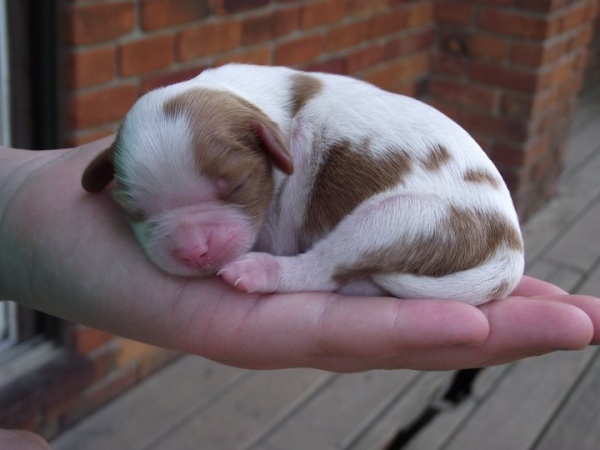 She is a beautiful white/cream color For a puppy she is quite calm and eager to please. She seems to learn quite quickly and does have a sweet disposition. 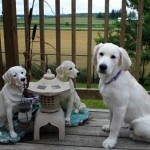 Thanks to Jennifer and Opal for breeding such beautiful dogs both in spirit and in appearance. We love Pearl and hope to be half the people she thinks we are. Here's a photo of our little "inspiration" with her ball. Letter from Mario & Lorraine C.
It’s only been three days since we brought “Strombo” home and I just had to write you and let you know, again, just how wonderful he is…just like the other three dogs that we have gotten from Chrys-haefen. Do you remember that we have had 4 dogs now from you over a period of 29 years ( the first dog 1980 )? 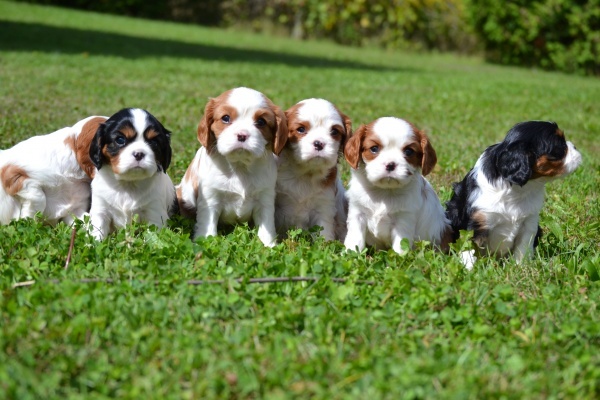 And each one of them has had the same perfect breeding for beauty and temperament. It’s like they are clones of one another. I had Strombo to my vet today for his first check-up and she too marveled at his beauty and his magnificent temperament She has looked after my other dogs and it was she that remarked on how consistent our dogs are. You truly are an excellent breeder. 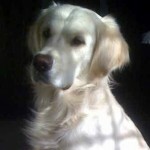 There is no other breed that I would even think of and there is no other breeder from which we would get our golden. 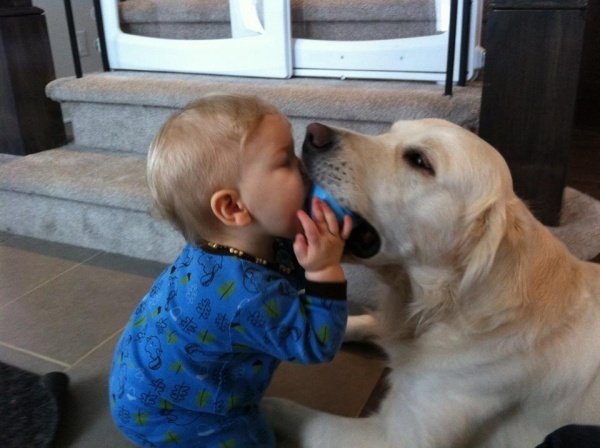 Your dogs have given our family 29 years of pleasure and love. 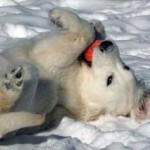 So many people over the years have remarked on our dogs, how loving, smart, playful and protective they have been. We always tell them it is because they are Chrys-haefen dogs. Thank you again. 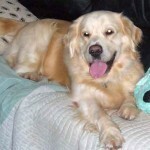 I am coming up to my 4th golden from Jennifer McAuley. I got my first dog in 1980. All of the goldens have been of beautiful conformation and excellent temperaments. 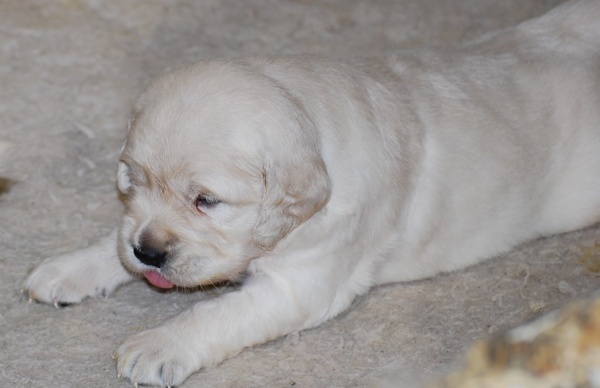 There is just no other breeder/kennel that I would consider for another golden. 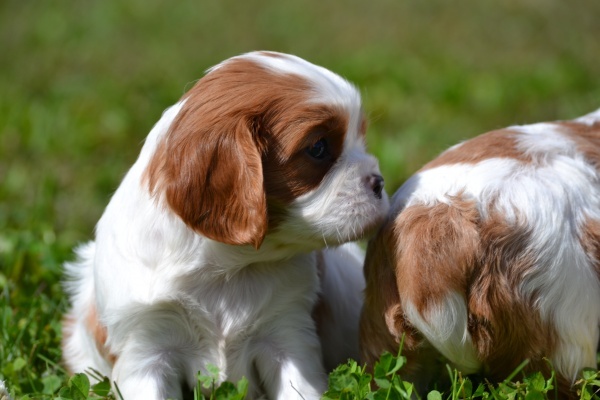 It speaks to Jennifer’s distinction as a breeder that she has maintained such quality breeding over the decades. Just a note to let you know our beautiful puppy Finn McJagger (Rigger/Juliana June 13 2008) has grown into an even more beautiful dog. He was 9 months old on March 13th. He has kept us all very busy with lots of fun. 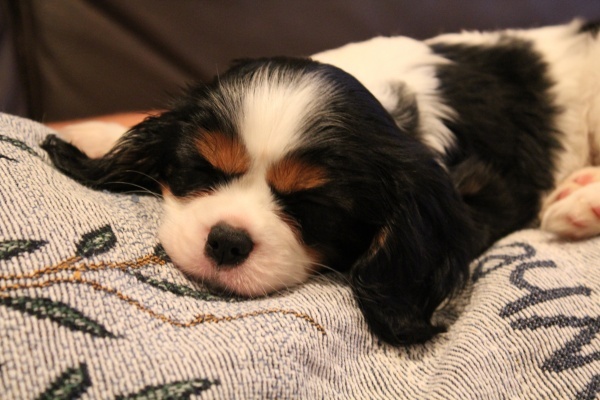 My husband and I have taken him to puppy obedience and beginner obedience classes. He kept everyone in the class in stitches with his funny antics but surprised all of us when he placed third in the final obedience test. He definitely stands out in the class as a great looking dog. He is a beautiful, very intelligent, gentle boy who is naughty and nice at the same time. He has added so much joy to our family. I have attached some photos of Finn taken over the last 9 months. Letter from Jackie & Darrell E.
Letter from Brenda & Brennan F.
Just a little update. Our Roxy is an absolute gem! She has so much character and charm, yet is so polite and sweet. She is smart as a whip! We haven't had a pee accident in the house in 6 days - pretty amazing for a 10.5 week old pup. The first couple of weeks were a little hairy, but she is settling in well. We cannot get over how many word phrases and commands she is picking up on already: * sit * down * come * night night * do your business * on the matt * shake a paw - Spencer's favourite * give a hug (oh what a cuddler she is!) * get your bone * get your lambie * off * shhh shhh * Where's Spencer, Courtney, Mommy or Daddy * Let's go see Grandpa (my parents live on our street and she loves to walk down - my Dad adores her) Its unreal, she is so smart. She had a bit of trouble being left alone in the crate and if I left the room at first. But with lots of patience, praise and treats, she is making big strides this week and we are able to leave her in the crate for 2 - 3 hours at a time in the day. I carry her, but we have been taking her to the market, the movie store, the carwash and a few places so she can meet different people (no dogs til her shots). She is so gentle and calm around everyone even in big crowds. She is doing really well in the car, we just do short jaunts to keep them good experiences. She settles and falls asleep. You should be so proud of such a lovely pup. Thank you thank you. Dooley will be turning 2 next month so thought I would send along a few pictures to you to show you how he's grown and prospered! He is indeed a joy to all of us and we love him as much as he loves his "people" (although his favorite person in the family by far is Sarah, 16, who is also the photographer!) Dooley is loyal, loving, and has a great temperament and is so smart! He loves going to the cottage ( although hates the drive, lucky it's only an hour!) We love having him as a part of our family! Thank you! 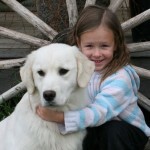 I was lucky enough to get one of your pups and purchased "Hope" (She now goes by Kalli), in March 2009. I just wanted to say I have been more then thrilled with her as is everyone who meets her. My mother is so enthusiastic about my dog that she is considering coming to visit you herself for a pup. Anyway I wanted to extend my thanks for providing me with such a loving friend - who is also incredibly entertaining! I got jersey just over a year ago and I love him more then words could ever say. He is such a great dog, good looking smart loving. A total joy to have. He is like one of the children. He means the world to me and my family. He makes me smile and he is always willing to go for walks or just hang out with me. I thought since it was Jake’s first birthday, I would send you a couple of pictures taken in the last couple of weeks up at the cottage. As you see, he is looking just beautiful and has the most wonderful personality. He is a seriously determined little guy and once his mind is set on something, it takes a lot to get him to move onto something else. He is extremely gentle and affectionate but has certainly taken on the big personalities of his older brother Cory & Dexter. Cory is top dog and keeps Jake in line, whereas Dexter allows Jake to do whatever he likes to him and never growls, snaps or reacts, even when the little monkey is hanging onto his ears or grabbing his jowls. Jake is our first ‘small’ dog and I was a little nervous about how I would accept one so little, but he has all the personality of a big dog and seems fearless of anything. He is a tough little fellow and spends his days up north chasing Chipmunks in the bush. We have a little bell on him when we’re at the cottage so we know where he is and also so bigger animals will know he’s around. We’re on a point, so he’s completely safe to run around and is never far from Dexter to whom he is devoted despite bullying him continually. Anyway, suffice to say we are thrilled with him and love him more each day (if that were possible). He has become part of our family and seems to love his life with us. I would say he was a very happy little dog indeed. Hope you’re all well, Best. 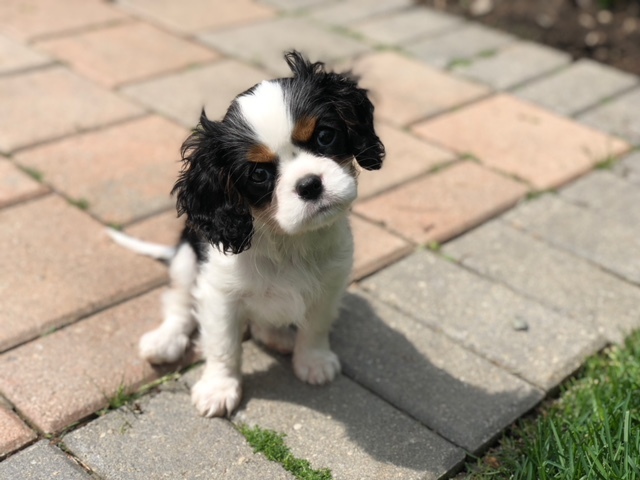 I've been meaning to send you an update on Dolce (from Sophie's litter - Fancy Rose is her registered name), but time seems to have gotten away from me! 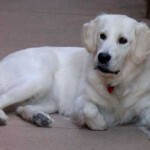 Much like all of your testimonials, Dolce is a beautiful dog and well loved by everyone. She's aced both her Obedience and Tricks classes and absolutely LOVES training. I've never seen a dog so keen to learn new things and show off for anyone who's watching. Any time that she's near water (the lake, kiddie pool in the backyard, a puddle!) 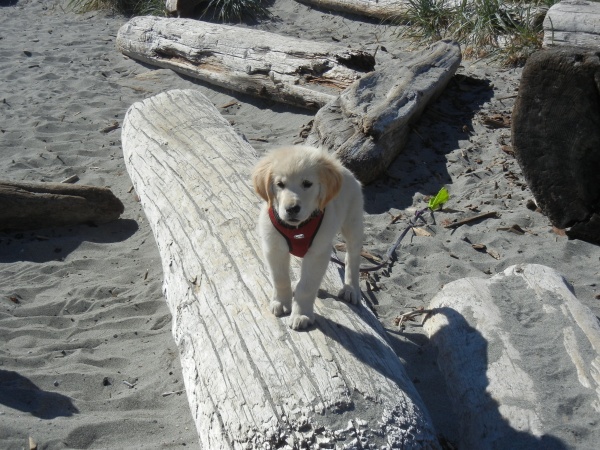 she's ready to go and play, swim, and splash around, with retrieving being a great activity for her to stay focused. Her lovely temperment and calm, quiet demeanor have caused more than one person to say she is "an older dog in a puppy's body". She gets along beautifully with all other dogs and is very keen to get along with my cat, although he has other ideas about that! I've attached some photos of her over the past months so that you can see how well she's doing. She's been a great addition to the family and thanks for breeding such a lovely and sweet (- that's what her name stands for) dog! 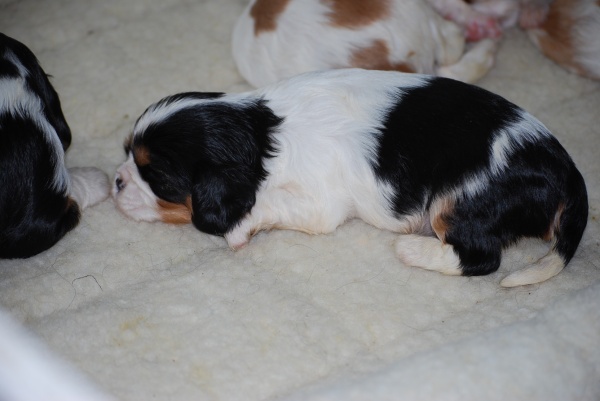 I just thought I would send you a picture of Rigger - puppy from Gemma and Sherwood's litter. He's out on the back deck with his "friends"....LOL! Rigger is growing up fast and gets lots of compliments and attention wherever we go. He's also in obedience training and is doing well there too. We can't remember what life was like before Rigger came along.....well, OK I remember it was quiet but definitely not as fun... Thanks for such a beautiful pup!! Just a note to advise that Chrys-Haefen Ezekial went to sleep last night at the ripe old age of 16. 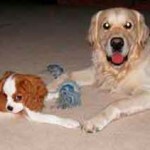 I was the second owner of Zeke (I got him at 4) nad he was a healthy, getle teddy bear his entire life. 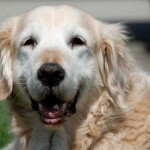 I have never had a dog live that old and I thought you would like to know that he was such a fine friend and companion. I thought I would pass this picture on to you. Here is Chrys-haefen Molly Erin Hollingsworth on the beach today. Unfortunately Molly closes her eyes when she has her picture take. Molly was a pup of Belle's in October 1998 and Molly is doing very well. Molly has brought alot of happiness to our family and will continue to make us laugh for a long time to come. I'll try to post her picture on your web site. Thank you for a great dog! Edith K. H.
Molly was born to Belle (if I remember correctly) in October 1998 and over the past twelve years Molly has been a source of love and happiness in our family. She is such a joy and I'm sure has many more years to be with us. Thanks for a wonderful, beautiful dog!